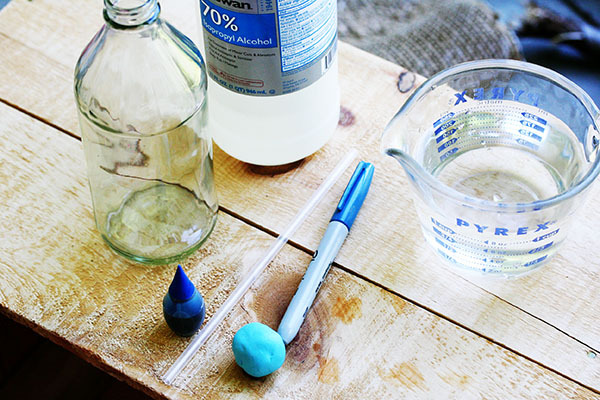 I love to do easy science projects with my kids and this homemade bottle thermometer is a great activity for curious minds! 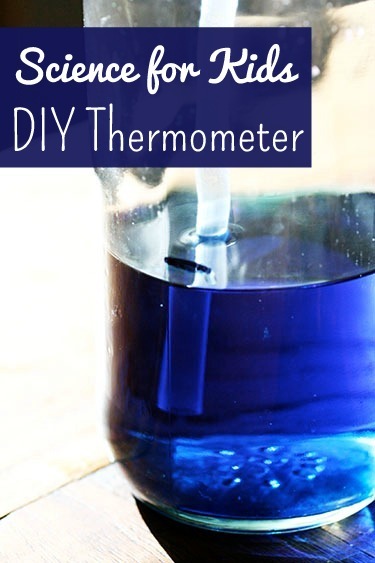 Did you even know it was possible to make a thermometer at home? And out of a bottle? Uh, I did not. Well, clever-clever Annie from Bird and Little Bird and the beautiful e-magazine Alphabet Glue did. Lucky for us she is here today with this intriguing science project: how to make a homemade thermometer. Fortunately, no mercury is required. These makeshift thermometers are one of those stand-by science projects that I ran across again and again during my years as a teacher. I never quite understood why they were supposed to be so cool — until we made one. Indeed, this little experiment turns out to be weirdly, ridiculously fun. Maybe it is because it works so well while still being so easy to make. Or perhaps it has something to do with the fact that the effects of the experiment can be relatively dramatic, making it almost like a toy rather than an instructional tool. I’m not sure, but I know that my daughter and I had great fun with this one, and I suspect that you will too. Begin by gathering up all of your materials. We used a glass bottle from the bulk section at the grocery store (it used to hold maple syrup) and a clear plastic straw that we snagged the last time that we stopped for a smoothie. Fill the bottle 1/4 full of plain water. Then, add an equal amount of rubbing alcohol so that the bottle is half full. 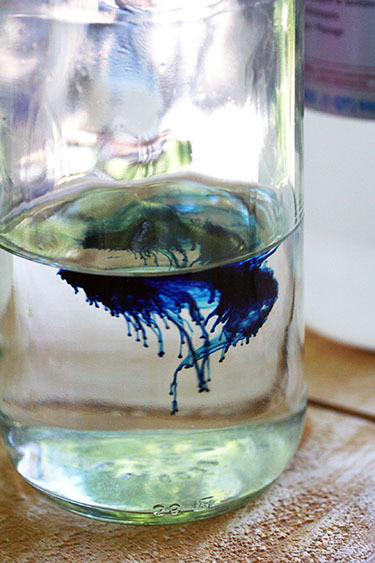 Add a few drops of food coloring. 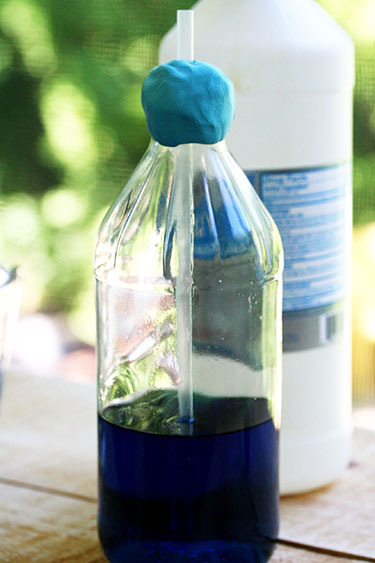 Put the straw into the bottle, and holding it so that it does not touch the bottom but is suspended slightly in the liquid, wrap the modeling clay around the top of the bottle and the straw. This will hold the straw in place and prevent it from falling farther into the bottle. Note how far up the straw the liquid now comes. 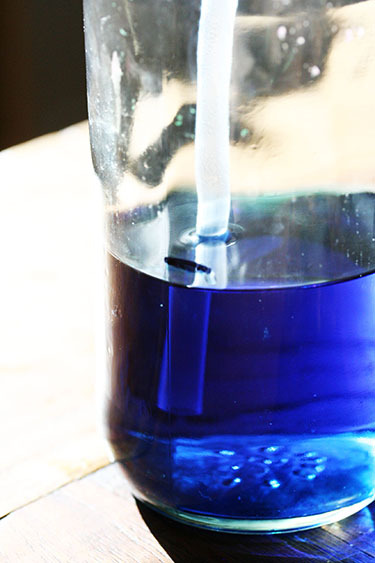 Use the marker to mark the outside of the bottle at the spot where the straw goes from being filled with liquid to being empty (i.e. the line where the liquid stops filling the straw). This line shows the current temperature where the bottle is at the moment. 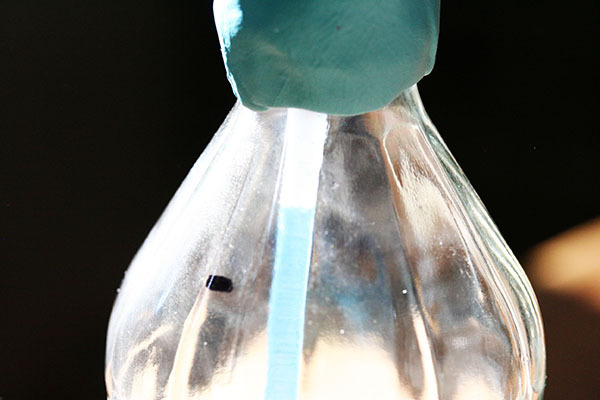 Move the bottle to different locations where the temperature is likely to differ. Notice how the liquid either rises or sinks down in the straw. In warmer temperatures, the liquid will rise. In cooler temperatures, it will sink. Try placing the bottle in direct sunlight, on a porch outside on a warm day, or in the refrigerator to see the liquid in the straw rise and fall with the temperature variation. What’s at work: The liquid in the bottle expands when it is warmed, and contracts when it cools. There is only so much space at the bottom of the bottle, so when the liquid gets warmer, it rises in the bottle and is forced up into the straw. When the liquid is in a cooler environment again, it will begin to contract, moving down the straw. This experiment won’t give you an exact temperature, only a real thermometer can do that, but it will allow you to generally see which environments are warmer or cooler than others. Alphabet Glue, is an e-magazine for book loving families, published every other month, and full of everything from book-centric crafts to easy kid science that the whole family can enjoy. 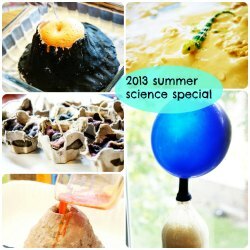 I have also been working on making an annual tradition out of publishing a totally science-themed special issue each summer; a little extra inspiration for families looking to explore basic science concepts through fun and easy experiments and projects, most of them using only ordinary ingredients found in the average kitchen cupboard. The Summer Science Specials each consist of a quartet of engaging activities, with each experiment or project being paired with a short review of a great kids’ book that complements the activity well. Along with the review comes a list of additional titles that would be solid choices for rounding out the featured activity with some reading on the scientific theme at hand. From non-Newtonian fluids to the features of bird’s eggs, the Summer Science Specials have a little something for everyone. Here is an experiment from last year’s special issue. Enjoy! Annie Riechmann is an educator, blogger, and mama to two small people who lives in the Boston area. Annie is also the creator and publisher of Alphabet Glue, a literacy themed e-magazine for families. She is a big believer in tree climbing at any age and of wearing knee-high striped socks. You can visit her at her online abode, Bird and Little Bird, where she writes about everything from books and babies to laundering snowpants and the joys of putting a husband through residency. This is certainly very cool! I think we’ll do it one of these days. Pinning it. I’m glad that you don’t need mercury. What a great experiment! Pinning it and trying it out next week with my kids! This experiment was a revelation! I had no idea this was even possible. My son would go crazy over this! Thank you for sharing. This just got added to our “must do” list. I’m featuring this tomorrow at the After School Linky Party. Stop by to check it out and keep sharing! We tried this experiment once when I was teaching in the classroom. I was so excited to see your version linked up to Discover & Explore. I’m featuring you today in a collection of weather experiments for kids. Thanks for linking up! Looks really great! I can’t wait till I do this with my 8-yr-old grandson – he lives in Singapore and I live in UK, but I’m going over there in the new year. But just one thing: surely it is the air over the liquid that is doing most of the expanding? It usually does. That may be, Richard. Clearly you know much more about the science of it than I do!